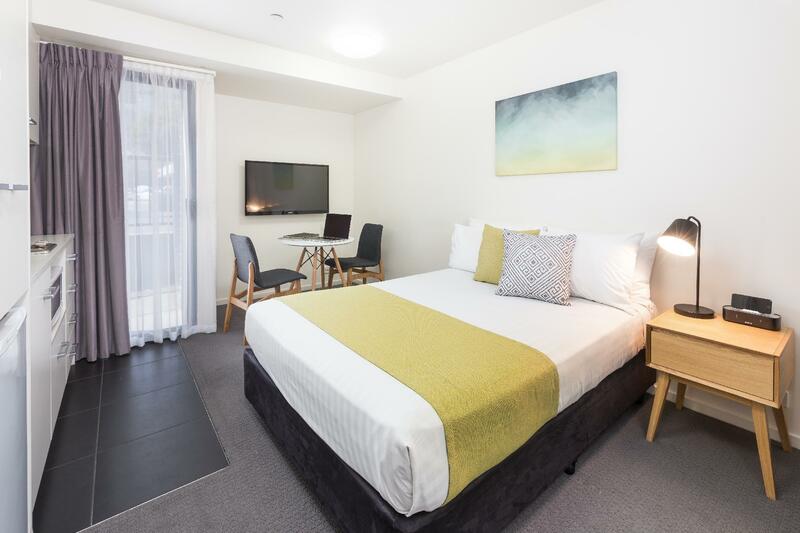 يقع فندق City Edge Apartment Hotel North Melbourne، المصمم ليناسب كل الضيوف سواء كانوا من رجال الأعمال أو السياح، في مكان ممتاز في أحد أكثر المناطق تفضيلاً في هذه المنطقة. يمكن من هنا للضيوف الاستمتاع بسهولة الوصول إلى كل ما تقدمه هذه المدينة النابضة بالحياة. إن سهولة الوصول من الفندق إلى المعالم السياحية الشهيرة الكثيرة في المدينة هو استثنائي بحد ذاته. 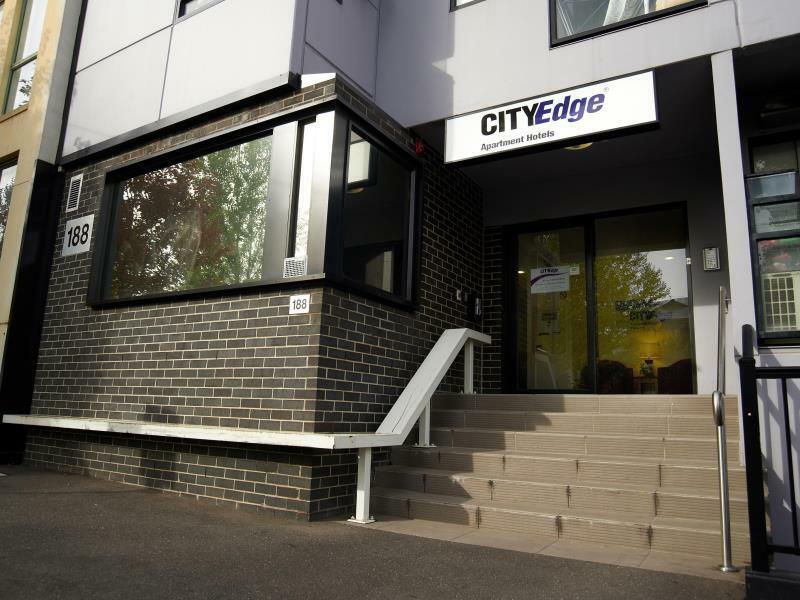 يعرف City Edge بالمستوى الراقي لخدماته ولباقة موظفيه، وهذا ما ستجده في City Edge Apartment Hotel North Melbourne. تتضمن الميزات الرئيسية في هذا الفندق: واي فاي مجاني في جميع الغرف, مرافق مخصصة لذوي الاحتياجات الخاصة, تسجيل وصول/خروج سريع, تخزين الأمتعة, واي فاي في المناطق العامة. في الفندق غرف نوم يتجاوز عددها 55، كلها مجهزة بعناية وجمال وبعضها مزود بـ تلفزيون بشاشة مسطحة, سجاد, كرسي عالي للأطفال, مواد تنظيف, قهوة فورية مجانية. صممت خدمات الاستجمام في الفندق والتي تتضمن حديقة لمساعدتك على الاسترخاء والراحة. 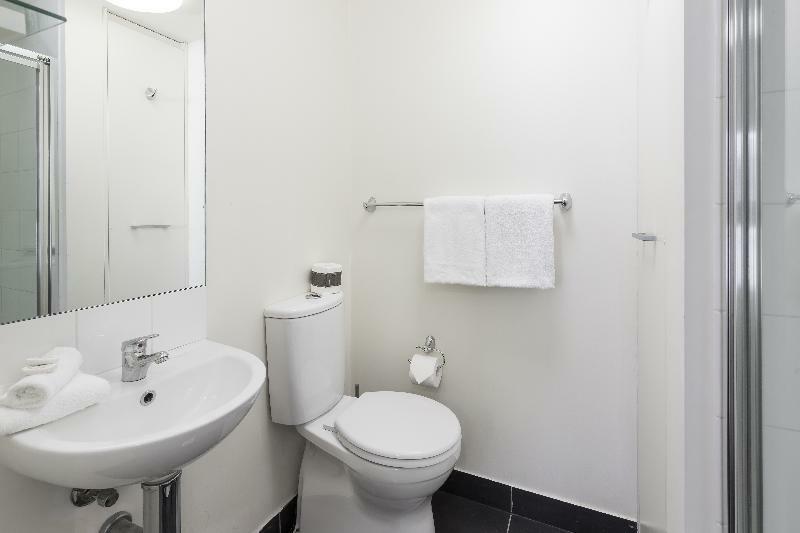 إن City Edge Apartment Hotel North Melbourne هو خيارك لخدمة الفنادق الراقية في المدينة. يُرجى العلم أن خدمة انتظار السيارات متوفرة لقاء رسوم إضافية، ومع هذا يجب الحجز بشكل مسبق. يُرجى الاتصال بالفندق مباشرةً للحجز والحصول على مزيدٍ من المعلومات. يُطلب مبلغ تأميني من البطاقة الائتمانية بقيمة 100 دولار أسترالي عند تسجيل الوصول؛ لتغطية المصروفات العرضية أو الرسوم أثناء الإقامة، ويُسترد المبلغ عند المغادرة. لا يتم توفير خدمة التنظيف إلا للنزلاء الذين تزيد إقامتهم عن 7 ليالٍ. يمكنك طلب خدمة التنظيف يوميًا نظير رسم إضافي. 5min walk to/from the free tram zone. 5min walk to Queen Victoria Markets. Room was comfortable. I could hear some noise from other rooms, but my neighbors were quiet - so I hardly payed it attention. Nice water pressure in shower, albeit not much room to turn. Wish they had complimentary milk for the complimentary coffee. Aircon was fantastic. Overall great place to stay. This is the second time we have stayed at this hotel. Great location - only a few minutes walk to Queen Victoria Markets, and there's a tram station across the road. The room was relatively clean and included some toiletries, as well as coffee, tea and some milk. The bed was comfortable and the studio apartment was everything you would need for a short stay. The staff arranged a very convenient hotel pickup at $20 per person. At this price, we would stay there again next time we're in town. Didn't bother to pick up dirty towels on the floor when left clean towels on the bed, left the bedsheets on the bed for us to change ourselves. Knock on our door to clean the room when we didn't leave the door paper to clean the room. They want to clean the room at their own time & convenience. This hotel is my default hotel whenever I am in Melbourne. Accessible to all types of transportation and restaurants. Closeness to city and facilities were good as well as access to transport. We were late arriving and were given good instructions to check in and had no issues. Staff were friendly and most helpful at all times. I would stay there again and would recommend to all my friends and family. City Edge offers great value for money with a location that's good if you don't want to be in the CBD. Tram stop at the corner is one stop outside of the "Free Zone", so if you walk down to the next block (Queen Vic Markets) you get a free tram into the city. Room (Studio Apartment) was fresh and clean, with enough space to work at, however it would have been nice for the chairs to have a bit more padding! Bar fridge and hotplate meant that I could make breakfast and dinner without much fuss, however unfortunately there's not a supermarket within walking distance. Overall good value for money, but a few little extras would be nice. Arrived in the early morning and once reception opened the kind man let me and my travel companion check in early and I really appreciated it cause I did not want to carry my luggage everywhere. Room was quite small but it was functional and was happy with it. It was clean and transport was right outside the hotel which was a bonus and not far from the CBD and places to eat at. I would highly recommend this place to anyone who's travelling with just a friend as it is quite small. 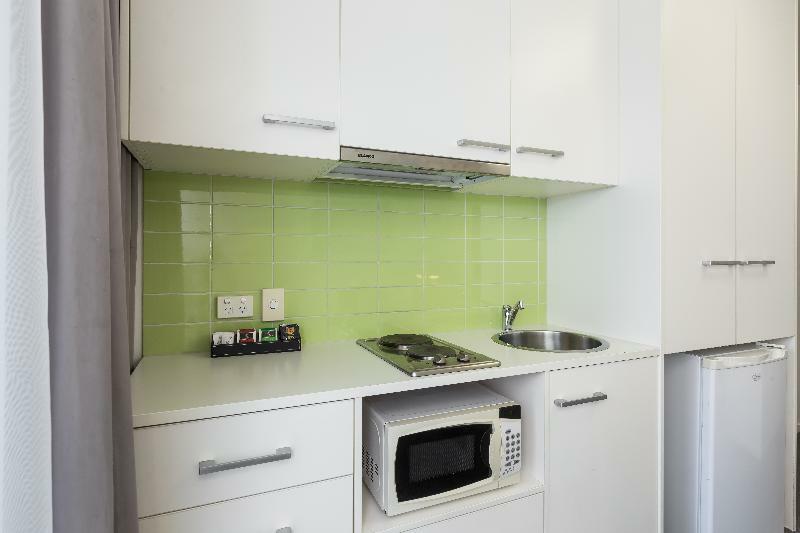 Good location, short walk to Vic Market and Free Tram Zone. Very helpful staff. Down side was that Agoda advertised free internet whereas it wasn't free. There were few things broken (towel holder, toilet seat, and table was wobbling) but these were fixed as soon I informed the front office. It was ok. Didnt like the fact that the blind on the window didnt cover the whole window, and getting woken by the sun in the morning. It was a comfy room. It was a bit weird having to get there and it doesnt have someone in reception all the time and your key gets left in a safe. I prefer the customer service of speaking to staff. I would not stay here again. The room was tiny, cooking area & bathroom is directly next to the bed! The bed is extremely small, and the bed sheet doesn't look so clean. The bathroom was so small with broken iron board hanging on the other side of the wall, shower room has very unpleasant smell, maybe from the drain of something! Luckily I was only stay a few hours, disgusting! Location, clean room that had everything needed for short stay, parking nearby. From the country for an overnight stay to see a show and shop at Victoria Market, we wanted a quiet hotel in a central location. We found the room clean, small, but adequate, well equipped, and well priced. We will use this hotel again. 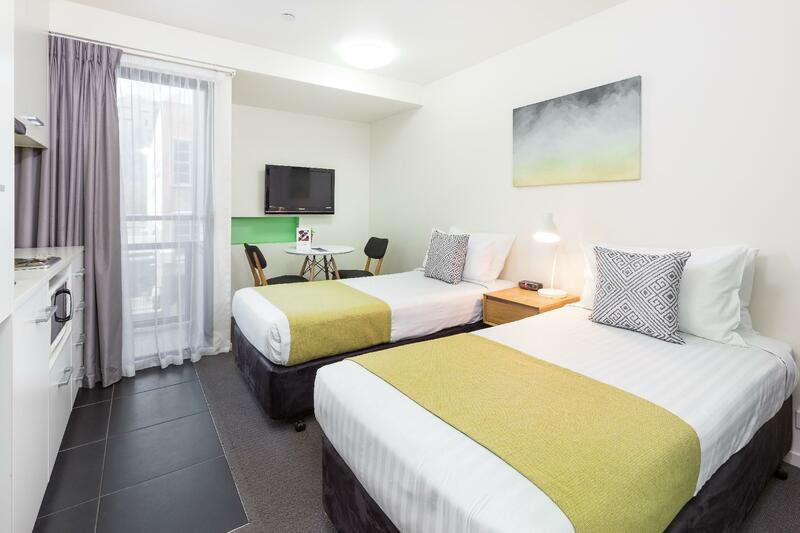 A well designed self-catering room; extremely clean (spotless); tram station 1 minute away; we really enjoyed walking to the Queen Victoria Markets for breakfast each morning. Beats a hotel breakfast any day! Close to where I had to drive to each day. Good cooking facilities. Private and quiet. Great heating on a cold night. My stay was comfortable. I was happy with the price. I intended to cook my own evening meals for health reasons and the cooking facilities were good for that. I arrived by car and had trouble finding a park to check in. After that it was street parking and paying for parking up to 6.30 pm. That was ok. Had trouble finding a general store or super market to buy some bread and milk. A short drive to Lygon st Carlton made me happy with the best pizza restaurants around. The Vic market was a 5 min walk so good for shopping. I have stayed here before and like the convenient location. Rooms at the rear are quietier away from the tramline road. There is a lack of hooks or rails in the rooms and the last one only had a smallish wardrobe with shelves for clothes. There is ample street parking but beware of the time limits. it was a good experience, before i reached hotel, i was afrid the room is terrible, because really cheap. but not, the room is really not bad, simply but clean,location is nice,can walk to Victora's Marketing only spend around 10mins.and one bus stop at hotel gate. i will back again if i will back Melb again.